Welcome to the official tasting room of Cowbelle Wines. You’ve just discovered the best New Mexico wine, beer, and cigar nook in the world. (At least that’s what our customers tell us.) 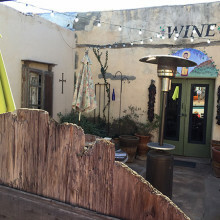 Relax in the historic ambiance provided by Old Mesilla; taste the best New Mexico wines and craft beers; enjoy entertainment that is sure to bring a smile to your face. That’s all we ask: Relax, Taste, Enjoy!